How Does HubSpot Staff for Inbound Marketing? Hubspot, a software company in Boston, has grown rapidly since its formation in 2005. It has achieved an amazing Compound Annual Growth Rate of 88% over the five years starting in 2009. The company sells marketing software for small and medium sized companies. Through articles, tools, and e-books, HubSpot ceaselessly educates these businesses on how to become more successful with their marketing and selling practices. Which raises the question, how does HubSpot structure it’s own marketing staff? What kind of people does it hire and how are they deployed? As you add members to your own marketing team, in what order would HubSpot recommend you hire them? If you knew how the staffing pieces fit together at Hubspot, then you could use their model to guide the staffing decisions for your own marketing team. Let’s look at the structure, production output, and costs of the marketing team at this successful company. HubSpot accomplished its growth through the use of Inbound Marketing and a large Inside Sales group. No one is surprised that HubSpot fueled its growth with Inbound Marketing. After all, the company invented the term and has relentlessly evangelized the use of Inbound Marketing methods. Using these methods, it has become a leader at acquiring customers in the small and medium business tier. Mike Volpe, the CMO at Hubspot, explained recently how to structure a marketing team of any size. He recommends that you assign each member of the marketing team to one of the first three inbound marketing stages: attract, convert and close. Attract: Your content writers, designers, SEO specialists, and social media managers. Convert: Everyone involved in conversion optimization, including landing pages, calls-to-action, lead scoring, and nurturing. Close: Your sales enablement marketers helping the sales team close opportunities. As your team grows Volpe recommends that you put the most staff on attracting visitors to your website. What would this mix look like at Hubspot? The 2014 S-1 document for their Initial Public Offering states that 351 people work in Marketing and Sales. In previous statements, Volpe said that the ratio of people in Marketing versus Sales is 4:1. With 351 people, that breaks out into 70 people in Marketing and 281 in Sales. If you subscribe to the HubSpot blog or visit their site often, you have seen that the company publishes a torrent of posts, articles, tools, and webinars. Now you can see how many dedicated staff are required to produce all this high-quality content. Eleven people are writing for the blog. Eight are producing e-books, tools, and webinars. And sixteen are working on a combination of search marketing and design. In all, thirty-five people are working at the top of the funnel alone. 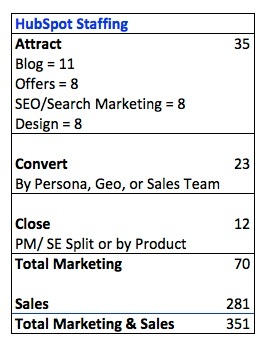 So what is the output for the HubSpot Marketing team and how much do they produce? Marketing produces leads and Sales converts them into customers. The HubSpot S-1 states that Hubspot produces 40,000 leads per month. Over 85% of these leads come from inbound marketing. These inbound leads are crucial to Hubspot’s success. They are cheaper to obtain than outbound leads and they convert into customers at a higher rate. Hubspot converts about 5% of its marketing leads into sales opportunities and 15% of its opportunities into customers. These conversion rates enable HubSpot to acquire 274 customers per month. 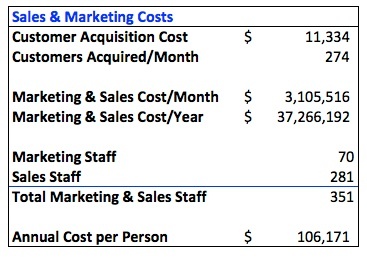 Now that we know how many leads and customers Hupspot produces with its Marketing and Sales staff, we can ask “How much does all this cost?” SaaS companies cannot allow their Customer Acquisition Costs (CAC) to get too high. If they do, each customer becomes a losing proposition. If the margin from an average customer’s lifetime value is less than the acquisition cost, suddenly you have a business that can never get out of the red. 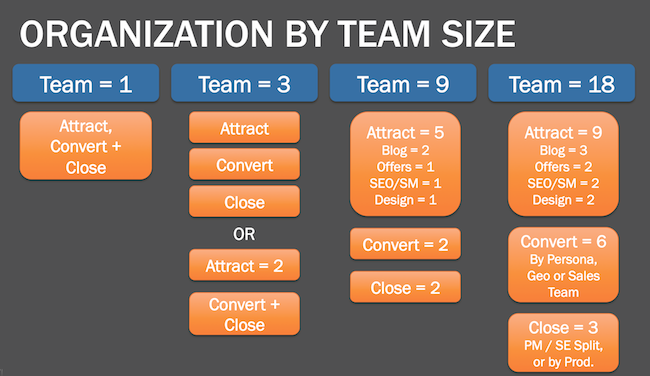 Finally, let’s apply the information we know about marketing production at HubSpot to smaller teams. How many leads and customers would the teams on Mike Volpe’s chart produce? We’ll assume that these teams have the same staffing ratio. For every Marketing person they have four Sales people. We’ll also assume that they have the same conversion rates as HubSpot. A marketing team of one person working with four sales people would need 5,190 visitors a month to produce four customers. A larger marketing team of nine people working with 36 sales people would need 46,000 visitors to the site and would produce 39 customers. With its relentless focus on inbound marketing to generate leads and a smooth relationship with Sales to convert them into customers, Hubspot has been able to post some of the highest growth rates in the history of SaaS companies. You can infer Hubspot’s business model for demand generation from the information the company has shared and use it to model your own business.